“Without question, I’m far more likely to hire MBA graduates who have had management consulting experience in emerging markets over graduates who have not,” said Amit Sinha, Head of Database and Technology Marketing at SAP. Sinha also explained that the team can include one expert in microfinance, one in public health, and another in marketing and publicity. Together the group brainstorms, creates a hypothesis, meets with customers and stakeholders in the community, and then develops their recommendations. “It changed my life,” said Atmore Baggot, referring to the management consulting position that was arranged for him by MBAs Without Borders (MWB) a program of CDC Development Solutions. MWB matches individuals and teams from graduate business schools around the world with skills-based volunteer projects in emerging countries. After completing his MBA at Thunderbird School of Global Management, Baggot joined ABT Associates through MWB to work on three projects in Paraguay. One assignment was to help a major healthcare NGO to shift off of USAID funding to become financially self-sustaining. Baggot conducted a comprehensive consulting project including strategy, marketing, finance, and human resources. Following an intensive 18-month MWB experience, Baggot was hired for the position he’s in today by Gallup. Together with a team that he supervises, Baggot works with company’s banking clients, in collaboration with the Ministry of Economy, to create jobs through the development of small and medium enterprises in Mexico. His dream is to expand the Gallup science throughout Latin America. Jailan Adly, Senior Program Director, MWB, sees a burgeoning interest among graduate business students worldwide in the skills-based volunteer experiences in emerging markets. “The richer the variety of perspectives and life experiences that MBA students bring, the greater the value to the management consulting team and to the clients,” he said. 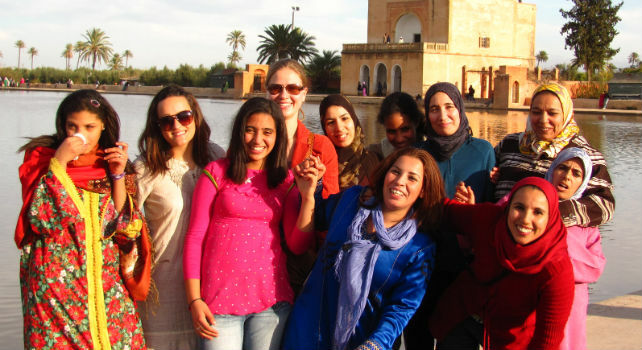 Triin Visnapuu is on an MWB assignment in Marrakech, Morocco, working with Al Kawtar, an association for handicapped women to create and sell crafts. Visnapuu, who blogs here, is helping them to restructure in order to qualify for national healthcare benefits and also build a profitable and sustainable enterprise. Visnapuu grew up in Estonia and obtained her BSc in Economics and Business at Stockholm School of Economics in Riga, prior to working in banking and then getting her MBA. While MWB engages individuals and teams from a vast array of graduate business schools worldwide, a number of MBA schools sponsor their own international experiential learning programs. Each school’s curriculum precedes the “in-country” component with rigorous preparation and follow up. Students work in teams studying the countries where they’ll be working, the client, and the business challenge in the context of an emerging market. MIT Sloan School of Management’s Action Learning program involves 300 students annually; most work in teams of four, and the in-country experience is two weeks in duration. According to Michellana Jester, Program Manager of Action Learning, MBAs in the Global Enterprise Lab collaborate with Ph.D.s on many of the projects. More than half of all the MBA students at the Haas School of Business at UC-Berkeley participate in the IBD, according to Kristi Raube, Executive Director. Harvard Business School involves all first year MBA students in the Field Immersion Experiences for Leadership Development (FIELD), including one week in-country; students work in teams of six. In describing the intensive preparation that occurs in advance of the trip, Professor Alan MacCormack discussed with me how students collect data and create and test their various hypotheses regarding their clients’ challenges. “For every difference you see, there are likely to be opportunities, especially in terms of infrastructures for business,” added MacCormack.